The new 4,076-lanemetre ALF POLLAK has been chartered by DFDS joining its own FIONIA SEAWAYS to add extra capacity to U.N. Ro-Ro’s/DFDS’s Istanbul-Trieste route. 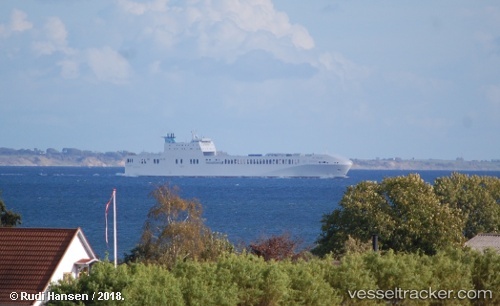 The 4076 lanem ro-ro ALF POLLAK, originally destined for Tirrenia’s Genoa – Livorno – Catania – Malta service is understood to have been chartered by CLdN/Cobelfret. Tirrenia’s new 4,076-lanemetre freight ro-ro ALF POLLAK, due for delivery anytime now, will enter service on the Italian operator’s MoS service in December between Genoa, Livorno, Catania and Valletta, confirmed Achille Onorato, CEO of Onorato Armatori Group, owners of Tirrenia, in Milan on 17 November. Sister ship MARIA GRAZIA ONORATO will also operate on this run when delivered in early 2019.